Liverpool FC highlights, match reports and post-match editorial content from LFC Globe. Watch the latest LFC goals and highlights from our providers. Note: Video highlights are provided and hosted by a 3rd party server. We do not host or upload this material and are not responsible for the content. Liverpool FC news, videos, opinion columns and transfer stories - updated daily with LFC news and discussion from Anfield with match-day coverage. All videos/stream links that appear on this website remain the property of the person who a) originally created the content and b) is responsible for uploading it to the internet. LFC Globe does not upload or stream any copyright material on our website and cannot be held responsible for any copyright infringement undertaken by the video/stream author. If you have a problem with a copyright protected video/stream, then please contact the site responsible for hosting it. 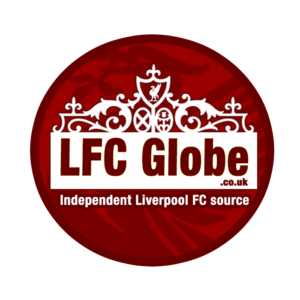 No videos and streams are stored on the LFC Globe server. If you are a copyright holder and wish for content to be removed, please contact us and we will remove the content as soon as we are made aware.